Here is another reason why you should microchip your pets. John and Kristin Pruitt were reunited with their dog, Petunia, a mixed-breed pit bull who had been missing for eight years. The dog disappeared on the Saturday after Thanksgiving in 2003 from a family farm in Fredricksburg, Virginia, but somehow, eight years later, the dog ended up on the opposite side of the United States at an animal shelter in Yuba City, California. 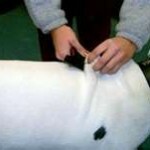 The shelter then used a microchip implanted in the dog to track down the dog owners. Debra Luis, supervisor at the Yuba County Animal Control Office in California, discussed the dog’s health, saying, The dog is in fine shape physically, though she also said there are signs the animal had not received enough nutrition in recent months”.